The Dearborn Ice Skating Center (DISC) features two NHL regulation-size ice surfaces (Adray Arena and Kilpatrick Arena), main arena seating for 1,500, upper-level meeting and banquet rooms, a concession stand and many more amenities. The facility is open year-round for ice skating and room rentals, and offers special event rentals May through July. For further information, call (313) 943-4098. 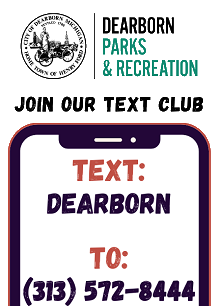 Would you like to receive text-message updates from the DISC and other Dearborn Recreation & Parks facilities? Just send a text to 797979 and type dearbornrec.